Susan al-Khatib, Sofas: A Series, 2007–08, and Doors: A Series, 2005–08. From How Beautiful Is Panama! 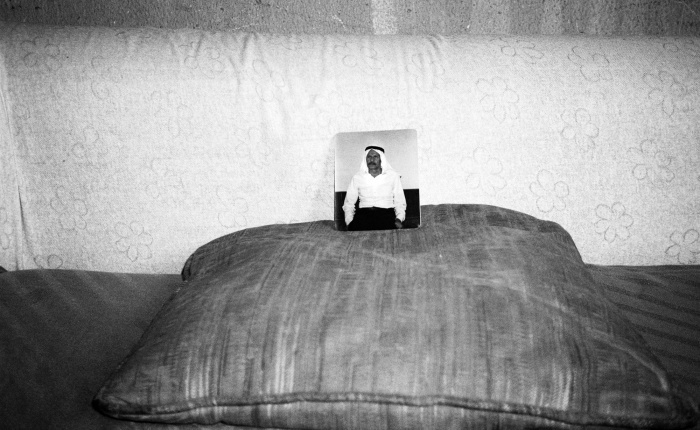 A photographic conversation from Burj al-Shamali camp, 2008. In the late 1970s, during a drawn-out house move, my parents sent us to holiday camp. This was no ordinary holiday camp, but the renowned and much-loved Butlin’s holiday camp in Mosney, a small town forty-five kilometres north of Dublin. Butlin’s holiday camps were the brainchild of one William “Billy” Butlin, an entrepreneur who had set up his camps throughout the British Isles with the expressed wish of providing affordable holidays for all. The motto of Butlin’s was “Our True Intent Is All for Your Delight,” and that was precisely what our family believed. We spent a halcyon week there unaffected, as we later recalled, by the fact that the camp itself was rather makeshift, the chalets substandard, the facilities inadequate for purpose, and the swimming pool an accident waiting to happen. Moreover, the maritime-themed restaurant was nothing more than a chipboard facade with some plastic seagulls suspended from the ceiling and, bizarrely, an underwater view of the swimming pool complete with the unwholesome sight of submerged, sunless-white legs and torsos. Needless to say, all of this would remain largely anecdotal and the stuff of family lore were it not for the fact that, as I recently found out, the Irish government subsequently saw it fit to turn Butlin’s Mosney—after a period of decline in its fortunes—into a holding centre for immigrants. All Butlin’s camps were essentially based upon the same model but with certain thematic variations. Butlin’s Filey, for example, and for no discernible reason that comes to my mind, had the “Caribbean Coffee Lounge” and the “French Bar,” whilst Butlin’s Ayr had the “Interior Continental Bar” and “Old Time Ballroom.” Butlin’s Mosney, for its part, had a ballroom and an indoor heated swimming pool that could be viewed by diners from the “Coffee Lounge.” The disconcerting effect of the latter and the mildly hypnotic effect of the colour schemes in these holiday camps can be viewed in Our True Intent Is All for Your Delight: The John Hinde Butlin’s Photographs (London: Chris Boot, 2002). At its peak, Butlin’s holiday camp in Mosney could accommodate 2,800 holidaymakers and an additional four thousand day visitors. In 1983, not long after our one and only holiday there, it was sold as a going concern, and in 2000 the then-owner signed a controversial five-year, £15 million deal with the Irish government that gave over the former holiday camp for use as a detention centre for asylum seekers. The financial deal to use the camp, albeit with a lower capacity, was subsequently renewed in 2010. It is now home to seven hundred refugees from over twenty different countries. Downey, Anthony. “Camps (or the Precarious Logic of Late Modernity).” Fillip 13.1, 2011: 38-47.